Lindi Pierce has contributed a major section on architecture for the upcoming book Wind, Water, Barley & Wine. In this excerpt she describes the daunting tasks facing pioneers in the forests of Prince Edward County. The forest, now widely viewed as a healing retreat from daily stresses, was ‘the enemy’ to the settlers. Contemporary accounts express the trepidation with which UEL families, accustomed to domesticated landscapes and farms, viewed the wild impenetrable forests. Local histories provide tantalizing glimpses of the extent of forest cover and size of its trees.Well-drained soils produced massive stands of great oaks, maples and mixed hardwoods, trees of a height and girth unimaginable today. The county’s fabled Wishing Tree hints at the size of the virgin hardwoods. This maple, which stood until 1940 on West Lake Road, had a circumference of 20 feet, and a 150-foot drip-line. Early accounts describe oxcarts fitting through the spaces between the trunks of massive pines. The central swamps produced giant white cedars, shallow limestone soils brought forth red cedars and junipers and massive willows softened the rocky shorelines beside the county’s only highways. Legendary stands of white pine flourished on the light sandy soil of a glacial esker stretching from the head of today’s Picton Bay in a band corresponding with the Ridge Road and ending in the Sandbanks region. Other pine plantations stood on Huff’s Island and Onderdonk Hill near Rednersville. These forests would later form the basis for several lumbering fortunes. But the newly arrived UEL needed a clearing in which to build his first home, and open fields to raise his food supply. (In a great irony, two centuries later, those same hard-won farms across Ontario are lying fallow, waiting for developers to bring subdivision plans.) With limited and inadequate tools, settlers worked in ‘bees’, without draught animals, to fell trees of legendary girth. They girdled standing trees and left them to die and felled dozens of forest giants into piles to be burned – valuable timber was sacrificed to the need for shelter. Today hearts would break at the carnage; in 1784 and in the years following, it was toil and deprivation that broke hearts. Loyalists rebuilding their lives in west Quebec province, which was to become Upper Canada in 1791, were confronted with a rich resource in the native forests which blanketed the land. The area’s first people, living light on the land for ages, had long utilized flexible poles and bark covering for their abodes. Early shelters built by the disbanded soldiers and Loyalists seeking shelter for their exhausted families would have used the same practical technology. Many early links are reported in local histories between UELs and the aboriginal people in areas of the county. Stories are shared about help in adversity; is it inconceivable that Loyalists learned to bend spruce poles and fashion bark siding from the area’s original inhabitants? These shelters were hastily erected lean-tos built of boughs and branches, with no windows, an arrangement of stones for a fire-pit and a smoke-hole for ventilation and minimal light. Accounts of the first winter in Fifth Town recall Archibald Macdonnell’s solid log house offering comfort to the disbanded soldiers living in brush shelters, in that bucolic cove now called Prinyers. The sturdier, more permanent home which soon followed was built of log. The choice of material was obvious. 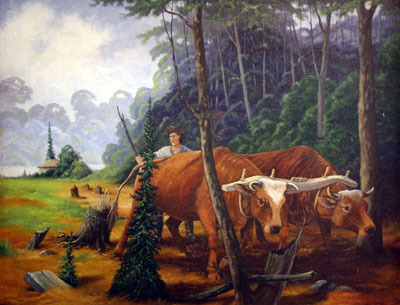 Armed with inadequate short-handled ship’s axes, the Loyalists attacked the forest giants – the native pine and hardwood of the area – and built log homes. Our modern mind has romanticized the log cabin. For us it represents the idyllic natural life, the Walden Pond spa experience; for the early builder, the log was the utilitarian and hard-won byproduct of the heartbreaking task of clearing the forest. The conversion of each tree into a building log was one more step in the taming of the dark terrifying forest standing between the new arrival and the vision of cleared productive fields and civilized landscape for which he yearned. The log cabin was intended to be a short-term arrangement; the Loyalist’s goal was to have a fine frame or stone house as he once had. Much, much more about Prince Edward County architecture will be available in the upcoming book, Wind, Water, Barley & Wine.